Continue the adventure with Scuba World! The PADI Advanced Open Water Diver Course is the next level in Scuba training. It provides the novice diver with a structured, well-supervised way to gain additional experience. You will be developing skills through an introduction to 5 PADI specialty courses. Advanced Open Water Certification is a lifetime certification to dive anywhere in the world to a maximum depth of 100 feet. The entire course consists of five dives which are conducted over a minimum of two days. The Advanced Open Water Class does not involve any classroom or pool work. Students must complete 5 sets of knowledge review questions that correspond with 5 open water dives. The remaining three dives can be chosen from any of our specialty dives offered (dives are usually determined by the dive site). Once you receive your training materials, read the text and complete the knowledge review questions at home, at your leisure, then schedule your dives. Prior to each dive, there will be a briefing specific to the dive. We will also go over the knowledge review and hand them in. You will need to have a dive light, cylume stick, knife, and underwater slate. You must provide a regulator/octo/gage, wetsuit, hood, and tank (this equipment can be rented from Scuba World at a cost of $75 for the weekend. What are the skills evaluation training dives? You may schedule and pay for your dives individually. If you are going on vacation you can complete some of your dives with Scuba World and the rest at your destination. Checkout dives may be completed on any of Scuba World’s dive trips. 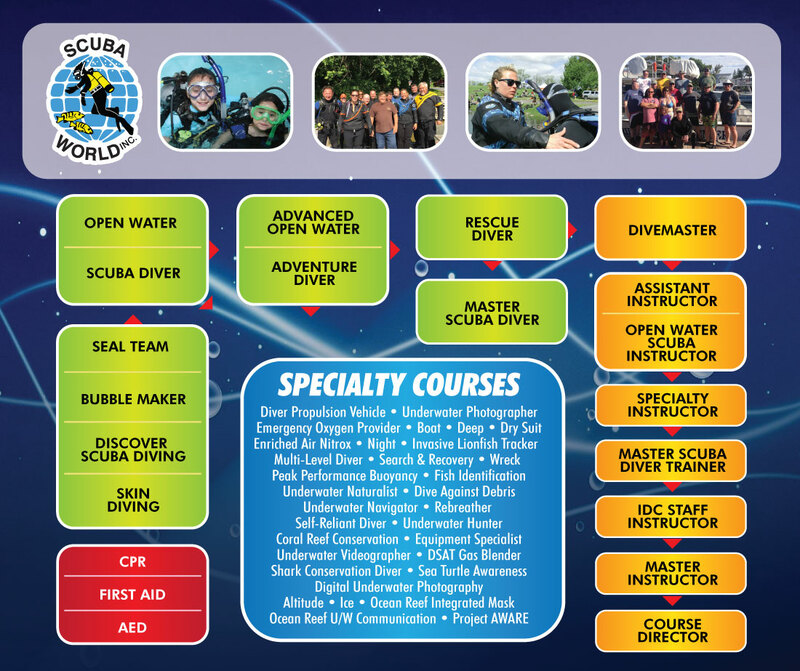 Ask about discounted courses on your next Scuba World dive adventure.